Bengaluru Arriving at my lodging in Bengaluru after 2 AM in the morning holds some surprises. One is the emptiness and quiet of the streets, normally full of horns blaring and the constant jockeying of cars, motorcycles, carts, cows, and hapless pedestrians braving all. The other is how much is going on in the relative quiet with stores selling, factories cranking, and workers on other time clocks pressing forward in the dark of the night. In the light of the day with bleary eyes, one of the first pieces of news to hit me was the report of the US Ambassador’s speech chiding the Indian government on its crackdown on nonprofits and reminding the “world’s largest democracy,” as India constantly calls itself, perhaps protesting too much, that NGOs have a vital role in civil society. Certainly crackdowns on NGOs are not uncommon in the world today in notoriously repressive governments. For example the Organizers’ Forum delegations have seen Russia and Egypt on a tear in recent years to peel back the work of any nonprofits, usually claiming reporting violations as the excuse. This repression of NGOs almost a year into the new government of the BJP’s Prime Minister Modi may finally answer the question of his true colors. There was no reply from the remaining NGOs leading to cancellation of their registration issued under FCRA…. 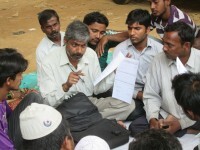 Among the registration’s cancelled 8,975 NGOs include 510 NGOs against whom notices were sent but returned undelivered. At one level this might seem reasonable. After all India will no doubt allege that the USA is the pot calling the kettle black since the IRS has similarly suspended the 501c3 classifications of thousands of nonprofits as well for failure to file annual 990 reports for three consecutive years. The controversial leaked report on NGOs was prepared for the new government by the Intelligence Bureau, an internal security agency. It called out several international organizations, including Amnesty International, Action Aid, and the Netherlands’ CORDAID for harming developmental projects relating to coal plants, oil exploration, nuclear plants, steel, and mining. The report singled out Greenpeace India, which was mentioned 15 times. It alleges that Greenpeace India is using foreign funds to hurt economic progress by campaigning against power projects, mining, and genetically modified food. The home ministry has asked India’s central bank to stop processing foreign contributions to Greenpeace. The report claimed that activism by foreign funded and Indian licensed NGOs who were blocking development projects was contributing to a “2 to 3 percent drop in the Indian economy.” For Modi, that was probably more than enough given his long record of economic boosterism from Gujarat that led to his sweeping election victory. In the year ending in March 2011, the most recent period for which data is available, about 22,000 Indian NGOs received a total of more than $2 billion from abroad, of which $650 million came from the US. What we’re seeing of the government’s attack on nonprofits augurs very poorly for the future under Modi. Please enjoy Jeff Beck’s Going Down, Thanks to Kabf. Bengaluru I had a long list of things I needed to get done on this trip to India, catch up with Dharmendra Kumar in Delhi on our progress at blocking multi-brand retail in Delhi and stopping foreign direct investment, state by state, and evaluate our growing, alliance with hawkers, and my coming visit with Vinod Shetty in Mumbai will focus on our progress in Dharavi and see the developments in the sorting system for our wastepickers were vital. 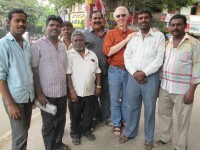 But, none ranked higher than visiting with Suresh Kadashan and seeing if we had finally succeeded in forming official, registered unions for the informal workers we were organizing in Bengaluru. The organizing was certainly not new. 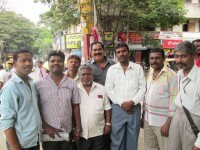 We had been plugging away at it for about five years with wastepickers, hawkers, domestic workers, and others, but eighteen months ago our decision had been to bite the bullet and register formally as an independent trade union under the laws of the state of Karnataka, where Bengaluru with about 5 million people is the capital and largest city. The rest of the world may know Bangalore by its old name and its reputation as India’s tech center or as “silicon” city, as some of the boosters are saying now, but that’s another world from our organizing with slum dwellers and informal workers. But every month we would try to register and could get no decision, and this went on, frustratingly, for over a year until this last December, when finally a deputy labor commissioner agreed to a path forward. Winning the registration was a matter of signatures from members and producing a minimum number (150) at a meeting of the street vendors. 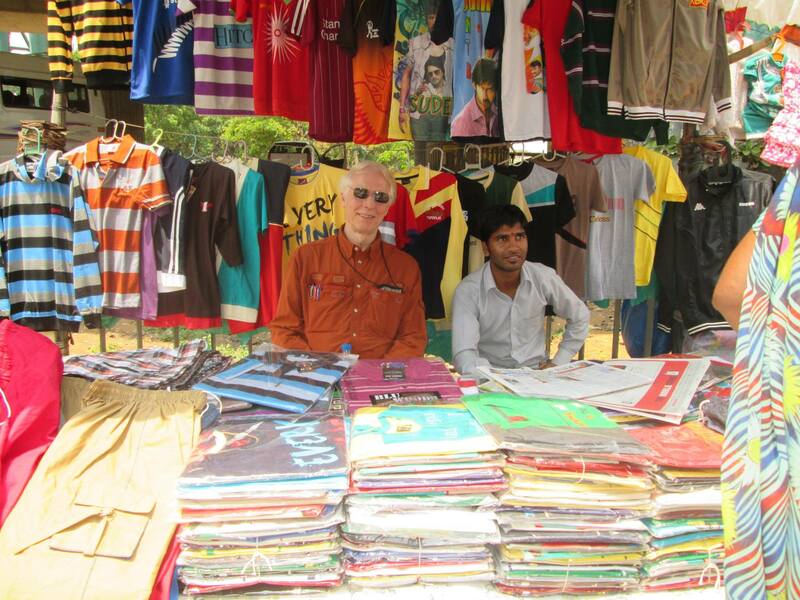 We now have organized the vendors in 25 different street markets throughout the city and once the process is finalized in coming months Suresh expects we will find ourselves with 6000 new dues-paying members. I was with Suresh yesterday as we bussed and auto-rickshawed to various street markets to meet with the officers of local branches of our new union in several places. 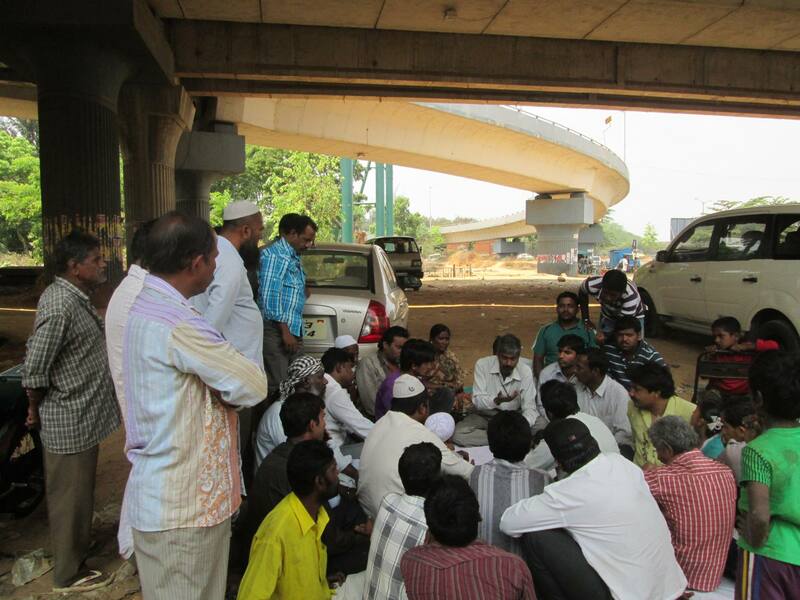 I also got to watch him have an impromptu noon meeting with 35 vendors on a side street market that needed to come into the union in order to fight for space under the Metro since a bridge was about to displace them once construction began. 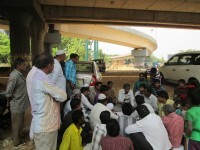 It was exciting to watch a small plastic tarp spread over nearby dirt transformed into an organizing meeting! Already our fledgling union has successfully filed cases against police harassment of vendors based on protections for sellers that are included in the state constitution, giving hard pressed hawkers some spring in their step. In the meeting as well, Suresh dramatically pulled out the application papers for a national pension scheme that could provide small retirements for our members after 60 based on a 2:1 match annually that, importantly, has to be certified by the official seal of our union. Registrations for a wastepickers union floundered, when the city privatized wet and dry garbage pickup, but we’re watching that situation closely. We’ve also now filed for a local union of street food preparers which could yield another 2000 members, once approved, and, yes, India is the home of the craft union, more than the industrial model, as you can see. 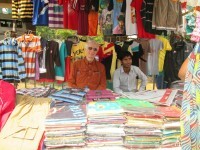 Opportunity within the informal sector abounds. Leaders estimated 130000 street vendors ply their wares in Bengaluru and perhaps a million-and-a-half are vendors among all of Karnataka 61 million people, but in this huge state, that’s still a bridge too far perhaps since 10 of the 15 districts would have to organize in order to win a statewide union charter. Big dreams and hard work, yield big dividends, and finally our new union is alive and growing in Bengaluru, but that also means even bigger dreams and harder work lie ahead of us in the future. It was thrilling to be a part of it all!